Paul Adams’ book Grouped offers some interesting quantitative data/results about human behavior, debunks the “tipping point” myth about influentials, and introduces (or should I say, emphasizes) a model of our social web. It has its pros and cons, while the bottom line is that it makes people think. In this post I’ll first try to summarize what I think of the book (premises, pros and cons, and a rating), then I’ll list out some key points in it I regard as highlights, and at last I’ll provide my comments. Actually, the book is all about one single sentence: Our social networks are made up of small, independent groups, connected through us. The author regards that as the single most important point of the book. That seeming simple idea has many implications, which are explained throughout the book. The author recognizes two goals for the book: (a) It gives foundational understanding of social behavior; and (b) it’s meant to inform how it applies to the future of business. IMHO, he did the former quite well and the latter poorly. Some interesting quantitative results about social web and our behavior. I guess that’s the main reason for the existence of the book — the author gained some important insights through researches, etc. 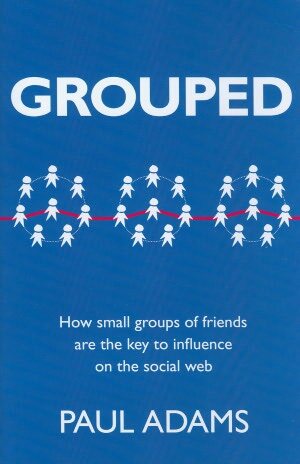 It introduces and emphasizes his “small intimate group” model of the social web, which is not really new. But it’s always good to hear about that kind of ideas accompanied by data and numbers. In general it’s thought-provoking, since that “tipping point” idea has been hailed for so long. Many strong dots (revealed through interesting quantitative results), but they’re rarely connected. Many good points out there, I just don’t see how they all come together, to what bigger-picture implication or revelation. The many “business” quick tips are too abstract to be useful. Not they’re not good — they’re simply not concrete enough to do any more good in a business context. It’d read so much better if they’re called, e.g., “Why Bother?”. I wonder whether it’s “pushed” by publisher (so that it’s a “business” book) or he really thinks they’re good business advices. With many dots scattered out there (like many cues and curves in a movie), I really expected something big to happen at the end. But it’s a movie without the 3rd act, no climax, no resolution. The author brings along many great bits and pieces and then fare thee well. I’d totally understand that you don’t have an resolution yet, but shouldn’t you at least tell me “I can only lead you here, my son, you’ll have to move forward all by yourself”? Regarding all the above, could it be so great not as a book, but as a full-fledged article? With pros and cons in mind, my final rating for the book being 3 out of 5 — it’s worth the read, but don’t expect anything more than its single one-sentence premise. Read “Conclusion” first, then, if you have time, read through the whole book real quick. Ignore those “quick tips” — they’re no more revealing than what comes before. Here’s a list of what I deem to be highlights of the book. Actually it’s more of a notes to myself and you can simply skip the whole section and jump to the next “COMMENTS: GROUPED BY WHAT?” section below. For ideas to spread widely, you need connected groups of easily influenced people, not “influentials“. In sooth, Paul Adams’ book tells us nothing new. The great thing about it is that it comes with research results — it just feels so much more convincing. All in all, we’re grouped by contextual interactions between real people, not between you and your machine (or the concept of a “web”). And since human being primarily use storytelling to communicate, we’re actually trying to implement a web that can afford and encourage seamless interactive storytelling — that’s just how we communicate. The so called social web still lacks something that keeps us adhering to it. First we have web, then we have social web, what’s next? Why the so called social networks are still boring? Think about it, Facebook, Twitter, Square, blog, whatever… they’re all the same — instantly interesting, lastingly boring. Why? How to improve that situation? And how to build services/business upon that? What Paul Adams talks about in Grouped is a simple revelation of the importance of interactive storytelling — something that happens a lot and well among intimate small groups of people (of course!). You don’t have interactions with Facebook, you only have them with your friends on it. You don’t have interactions with a brand, you only have them with someone who’s talking about the brand (either a friend or a CSR). That’s just the only way to keep you engaged. It’s all about interactive storytelling. If we want to move forward for the social web, we have to find ways to improve interactive storytelling. We need a context that’s meaningful for us to keep the storytelling going. That context needs to be guided and encouraged, hopefully with great help of technology. Current social networks lack the kind of rich context we have in the real world interactions (physicality, multi-form expressions, etc.) due to tech limitations. Current web (and companies behind it) takes too much from us, but gives back too little — not enough for us for get by in terms of engaging interactions. In the end the love you take is equal to the love you make — companies are taking so much information (big data) from us, and only when they can process it, transform it, and give it back to us in fresh, new, innovative ways, then we may be able to use and take advantage of it in fresh, new, innovative ways — when the interactions keep going on and that’s win-win.